SIMPSON BAY, St. Maarten (April 28 , 2014) - Seventeen Security staff members of the Princess Juliana International Airport (SXM) recently completed a one day course on travel document verification given by Linda Wiegel of the Royal Dutch Marechaussee. 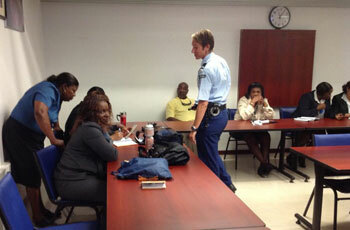 Ms. Wiegel works at SXM and is the document instructor for the Marechaussee and St. Maarten immigration. The course was coordinated by manager of the Security Department, Jerry Sprott and included section heads of security guards, and screening, passenger control officers, screening supervisors and security administration staff. The passenger control officers (who are now under the Security Department) are tasked with verification of travel documents, and should therefore be familiar with the basics. And since the screeners at times sit in for the passenger control staff, they too participated in the course. Topics covered by the course included document awareness, which would allow security to intercept false or invalid travel documents such as forged passports, impostor detection, profiling, and security features of the Dutch passport. According to Sprott, the course was not only timely, but also demonstrated SXM Airport’s commitment to safety and security of all users of the facilities. “In this post 9-11 era, airport security cannot be overemphasized; it is a vital component of our operations and as such keeping our staff up to date is very essential,” Sprott said. “The course will surely enable the security staff to be more effective when carrying out their duties,” he added.